With Facebook taking down pages linked to Pakistani cyber actors spreading disinformation in India ahead of the 2019 Lok Sabha elections, it’s becoming increasingly clear that India has been late in spotting the danger: if there is a Pakistani inter-services directorate as lethal as the Inter Services Intelligence, it is, undoubtedly, the Inter-Services Public Relations. Military strategists may balk at the fact that I am equating a notorious intelligence agency with an innocuous media management department. Since the times I executed cyber operations in the government, I have been obsessed with deconstructing the evolving mandate of this little-known outfit. And I have always held the opinion that the role, or rather the potential, of the ISPR has been severely underestimated in the Indian strategic circles. Cyber operatives like me have been envisioning this scenario since a decade: how the South Asian flashpoint would manifest itself in the cyber-enabled information battlespace. The Balakot escalation unleashed another invisible playbook of the Pakistani military, and the ISPR was its key orchestrator. Since 2009, the Pakistani Army has conducted a series of public wargames dubbed as Azm-e-Nau, meant to counter the elusive Indian Cold Start doctrine. With many successful iterations over the years, these exercises simulated massive mobilisations augmented by net-centric warfare, stopping short at the tactical nuclear weapons threshold. Azm-e-Nau (A New Beginning) further chiselled Pakistan’s homebrewed philosophy of hybrid war – fusing together many conventional and unconventional elements of conflict, power and diplomacy. Interestingly, the said wargames treated the ISPR as the crucial pivot of conflict escalation and de-escalation. It was meant to undertake information operations, military deception and strategic communications – benignly dubbed as perception management in military parlance. This was a couple of years prior to ‘hybrid war’ becoming all the rage in the media circles, manifesting itself as the wildly successful Russian playbook against Georgia, Ukraine, and the US elections. From leveraging non-uniformed militias to undertaking disruptive cyber operations that seeded widescale paranoia and confusion, the Russians reintroduced the cognitive dimension to this emerging format of war. There were other classified Pakistani exercises that also hinged at the deftness and dexterity of the ISPR’s information warfare strategy. All of this neatly converged, almost with textbook precision, in the showdown after Pulwama. Valery Gerasimov, the chief of the general staff of the armed forces of Russia, is thought to be the key proponent of its hybrid war philosophy, which first found mention in his 2013 article for a journal called Military-Industrial Courier. The contents of his article gained such prominence that the Western media now prefers to call it the Gerasimov Doctrine. Gerasimov clearly articulated and foresaw “the role of mobile, mixed-type groups of forces, acting in a single intelligence-information space.” He mused philosophically about “the blurring the lines between the states of war and peace.” “Wars are no longer declared,” exposited Gerasimov, “and having begun, proceed according to an unfamiliar template.” Gerasimov, Russia’s first deputy defence minister, was appointed by President Vladimir Putin in his current role in 2012. By March 2014, he was in the European Union’s list of people against whom sanctions had been issued. 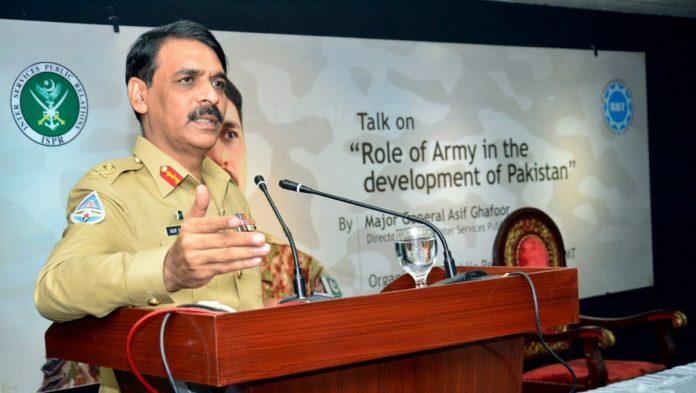 With his carefully orchestrated social media spectacles during and after the Balakot escalation, Major General Asif Ghafoor, the incumbent director general of the ISPR, proved to be a formidable disruptor as well. Pakistan Army troops shot down an Indian spying quadcopter in Rakhchikri Sector along Line of Control. Pakistan had an undue structural advantage in the information battlespace. International relations were the overarching backbone of India’s response to Pulwama. And rightfully so, the Ministry of External Affairs was tasked with communications. On the other hand, with the political establishment in Pakistan being a dud, the escalatory and de-escalatory ladders scarily fell fully under the military. It gave rise to a natural asymmetry. The hawkish ISPR, which must have been itching to flex its muscle, merely ended up conducting trademark information warfare manoeuvres like denial and deception. Indeed, there were times when its Twitter shenanigans pushed the envelope and stole the initiative for a few minutes. They did put the Indian machinery in reactive mode, especially after the capture of a fighter pilot. If one had carefully studied Ghafoor’s disposition and the enhanced mandate of the ISPR, then some of the tactical wins could have been averted. Back in 2017, the two-star general had the temerity to publicly rebuke the then prime minister Nawaz Sharif, after a media leak painted the Pakistani Army in negative light. Ghafoor is also the loudest exponent of the ‘Bajwa Doctrine,’ hinting at his closeness to the army chief, Qamar Jawed Bajwa. Ghafoor, however, is yet to be promoted to the three-star lieutenant general rank, which his predecessor, Lt General Asim Saleem Bajwa, was awarded with after holding the position for three years in 2015. Asim Bajwa is currently the Commander of the Pakistan Army’s Southern Command, stationed in Balochistan Province’s Quetta city. The shining or waning star of the ISPR completely mirrors the tumultuous history of Pakistan. Under General Ayub Khan, the Bureau of National Research & Reconstruction – the ISPR’s predecessor – actually had the mandate to conduct intelligence operations. Brigadier AR Siddiqui, the former head of the ISPR, is the author of The Military in Pakistan: Image & Reality. He openly speaks about the “self-love” and “self-promotion” of the generals that became the bane of ISPR’s perception management. That clearly seems to be the case with Ghafoor. In fact, a 2018 dossier of Amnesty International disclosed a series of cyber attacks that targeted Pakistani human rights activists. Due to the blundering operational security of the attacks, they could directly be attributed to the ISPR. Imagine a Goebbels-ian propaganda arm spying, kidnapping and even silencing journalists and dissenters. It hints at the unbridled power of Ghafoor in the current scheme of things. He has repeatedly postulated the theory of ‘fifth-generation warfare’, which thrives on irregular instruments and political chaos. Thankfully, we saw little or no action in the information battlespace. But due to the aforesaid advantage, the ISPR could have weaponised its mandate to wage a full-frontal cyber-enabled information offensive. This is something the Indian security principals may need to be wary of, as our domestic political environment is ripe for exploitation. I would also recommend that information operations officers from the tri-services Integrated Defence Staff be attached to our public relations divisions during the times of such crises. At a recent military conference where I spoke, a senior officer remarked at my unwarranted glorification of the enemy as I labelled Ghafoor as the Gerasimov of South Asia. From the Athenians and Spartans to Rommel and Patton, the obsession with peeking into the adversary’s mind requires some accommodation of his ingenuity. For some background, the chief architect of the Bureau of National Research & Reconstruction was the late Brig. F. R. Khan, who later served as Pakistan’s high commissioner to the UK, a man of great foresight and very well read (from Shakespeare to Stalin). He regularly briefed, and eventually persuaded, President Ayub Khan that as a front line state Pakistan would have to develop significant intelligence capability. Ayub took his lead and charged him with the responsibility of beefing up the Military Intelligence apparatus including the ISI and thus the leg work for the proficiency that we see in both the ISI and ISPR today is a culmination of that long drawn effort. Such was the foresight ..That beggars had been cut to size 4 times officially nd million times unofficially. Usage of SM is the admission of the fact that saviour of the nation has actually harmed the nation for its own superior status in pak. But it has been proven everytime fauzi foundation owners superiority is inversely proportional to existence of pak. Dear ThePrint, we learnt the lesson hard way, first it was the 71 saga. You guys very cunningly made a movement for rights in East Pakistan into a full blown insurgency, then mutiny and finally a successful assault. Now, since 65 taught you a lesson thatyou won’t stand a day in a conventional battle field. Like Run of Kuch was a massive defeat and quite a, large territory lost. So, read The dead reckoning, by Samita bose and you would know how things unfurled in East Pakistan. Now the Kargil episode was one piece which India surely won on TV screens. Pakistan had only one TV channel, India had more then a hundred. Tiger hill was created and Won on TV screens, peak 5353 was lost to Pakistan, and it is still in Pakistani hands, your defence minister George Fernande then famously said in Loksabha that peak can’t be taken back and the price would be insanely high. So tiger hill created and an imaginary battle fought, and won. Even the guy who was given Veer Chakra turned out to be alive and a massive embarrassment for Indian Army. But still TV screens won it, so the ISPR is a lesson learnt over almost a half century and being perfected.